World War 2 For Kids/Children - What Was It Like? Within the countries participating in World War Two, children suffered significantly alongside the rest of society. British children were relatively lucky when compared with children from Nazi-occupied territories, many of whom were killed as soon as they were captured. However, whilst children were not spared the abject horrors of the Holocaust, there were movements established before the war that helped children from the most dangerous areas of Europe escape to the UK, ultimately saving their lives. British children in urban areas were mostly evacuated to more rural areas of the country. This was, of course, a very scary thing to endure; children from wealthier families could usually guarantee being sent away with their siblings, but this was frequently not the case for children with less wealthy parents. More often than not, children were separated from their brothers and sisters on the platform. Roughly 1.9 million children were evacuated in the first three days. Schools were able to function as ‘normally’ as possible during the war, offering some constancy in the upturned lives of British children, even if they knew no-one else in their class. Air raid drills were a regular occurrence, ensuring children knew the necessary procedures for securing their gas masks. 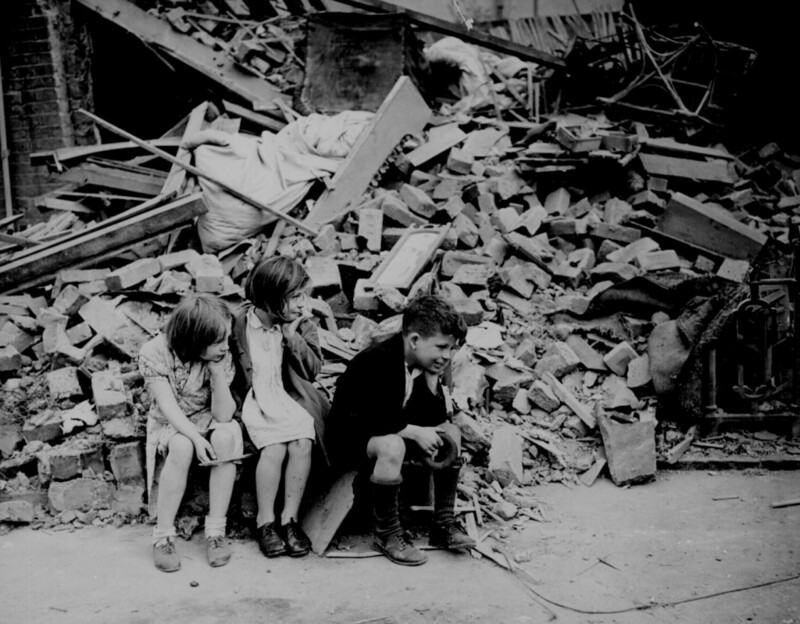 Children who remained in the urban areas found their lives were far more disrupted by the war; during the London Blitz 1940 – 1941, children made up 1 in 10 deaths. Occupied countries suffered the Blitzkrieg far longer than Britain did – Britain were able to deter the Luftwaffe after winning the Battle of Britain, but other countries had not secured such victories. The atomic bombs that hit the Japanese cities of Hiroshima and Nagasaki killed thousands of children amongst the devastating destruction. Children suffered enormously during the Holocaust; aside from the obvious losses of children in the death camps, more sinister tragedies occurred at the hands of Joseph Mengele. His notorious fascination with twins led to sadistic experimentation at Auschwitz-Birkenau, resulting in the deaths of many children. Those in the Holocaust not deemed old enough to be used for labour were often selected to be sent straight to gas chambers. Adolescents who were used in labour usually died in the harsh conditions. Many children in the ghettos and concentration camps found ways to escape, or smuggle supplies in, since they were small enough to slip through cracks in walls or fences. Many children in occupied Poland/USSR who had aesthetically Aryan features were sent to Germany to be adopted by suitable families, following the ‘Master Race’ tendencies of the Nazi ideology. This was seen as a privilege: being granted chance of ‘Germanisation’. Some salvation for Jewish children was organised in the nine months leading up to September 1939, in a movement called ‘Kindertransport’. This involved the transferral of Jewish children from the most volatile European countries over to the UK. It was instigated as a result of Kristallnacht (15th November 1938). A huge appeal to the British government was staged, asking them to allow the transportation of Jewish children without their parents. The Refugee Children’s Movement was established, which – teamed with the already operating World Jewish Relief – organised systems of selecting and moving the children from the affected parts of Europe. There was no specification that the children had to be relocated with Jewish families – any clean and respectable household would suffice. The first 200 children arrived in the UK on December 2nd in Harwich, Essex. Over nine months, 10,000 children were sent over from Germany, Austria, Czechoslovakia and Poland. They would often be met by Quakers at the port or station, who would direct them to foster homes, hostels, or other temporary housing. The Jewish group Habonim ran many hostels which housed Kinder children in the UK. A key figure in the transportation programme was Gertruida Wijsmuller, a Dutch woman who campaigned with local authorities and organised rescue missions. She sent over the last Kinder boat in May 1940 – the day of the Dutch surrender, and the intense bombings of Rotterdam. She was also responsible for the first Kinder train sent from Vienna in December 1938. Another important figure was Nicholas Winton, who ran and office of transportation for children in Czechoslovakia in 1938-1939, and found homes for 669 children. Once aged 18 and over, Kinder males were given the chance to join and serve in the British army. They proved extremely useful in the D-Day landings, utilising their language skills to aid the progression of the day, and subsequently as the army progressed towards Berlin. Four Kinder children went on to win Nobel prizes. After the war ended in 1945, many Kinder children in the UK found that they had no surviving family members, and felt isolated and alone in their temporary British homes. Many were rehoused on a more permanent basis, but there was a huge issue in the placement of the orphan Kinders. The programme was, from the beginning, called a temporary measure, and so when it was discovered that a huge proportion of the children from the continent simply didn’t have homes to return to, some were left to fend for themselves, forging new lives in both Britain and America. However, the very fact that they had no surviving relatives is a testament to the harsh reality that, had it not been for the Kindertransport programme, they too would probably have died. Sylvia Whitman, (2000), Children of the WWII Home Front. Minnesota: Lerner Publishing Group. Olga Levy Drucker, (1992), Kindertransport. New York: Henry Holt and Co.
Stephanie Fitzgerald, (2011), Children of the Holocaust. Minnesota: Compass Point Books.